The Lionine Eclipse theme from last year continues where we had the extremely potent Regulus Solar Eclipse back in August This January Lunar Eclipse has shades of the former eclipse but is less physical forceful. It still has courage but withholds making any bold moves until the very last moment. We could even call it a Blue Blood Moon! The Lunar Eclipse is actually a rare blue moon 2nd Blue Moon of the Moon and it will turn Blood red for the eclipse as the earth casts its shadow over it. The Moon in Leo decan 2 especially resonates with playing a very Queenly, backstage, strategic role. This Lunar Eclipse makes us warm hosts, who take control of any social situation. These Lions make sure that all guests are taken care of. The energy is great for organizing people and events so that the flames of enthusiasm and conviviality forge longstanding alliances. The Lunar Eclipse in Decan 2 can be a great benefactor for the arts and is a protector of children. It is fearless in its reasoning and will dive into debates with gusto. Jupiter rules this decan of Leo. Combining Zeus with the Lion King will create someone who relishes power and is very happy to give orders. Those ignited by the Lunar Eclipse then will be accused of being bossy. You can rely on this Lunar Eclipse to cut the crap out of any chaos rather than just faffing-about politely, not wanting to appear rude. A Leo decan 2 Lunar Eclipse does tough-love extraordinarily well, but sometimes make enemies because of this. The roaring mouth of the lion combined with the super-nanny energy of Ceres will never sugarcoat. The Lynx is practically invisible as a constellation. Lynx are associated with great sight and luminous eyes. Well, you would need great sight to see this constellation, as it is so faint. This was King Lyncus punishment, not being able to shine. Lynx are also loners too. It is interesting we have another connection to the Ceres here, which further activates the need to respect nature and natural law. At this Lunar Eclipse the Moon conjunct Ceres is not easily swayed and will stick to its principles no matter what. This aspect can work like the matriarchal version of Sun conjunct Saturn. At best these are the wise elders who pass on their wisdom to the young and serve as respected mentors in the wider world. Command may seem overly strict, but it is also a true case of tough love. Mercury is ambitious and determined in Capricorn and during this transit he will be even more so because the cycle starts with a conjunction to Saturn. astrology online free in hindi? cancer born january 15 horoscope! Use your mental energy to get things done. Something will have to go around these dates — Uranus will make sure you will get liberation from some old patterns of relating which do not longer serve you. Maybe you are too compromising, maybe in your desire to please others you sacrifice an important part of yourself. These squares to Uranus will show you what exactly needs to change. A few days later, at the time of the New Moon, you will have the chance to start anew. The New Moon will be the trademark of Saturn in Capricorn and will tell us know — without a doubt — what Saturn in Capricorn will be all about. The New Moon takes place around the same degrees where we will experience the Saturn-Pluto-Jupiter alignment in two years from now, so pay extra attention to the messages that come to you around this date. The New Moon in Capricorn will shed light into what will keep you busy in the coming years. When you know what to expect you can get better prepared for the future. On January 17 th Venus enters Aquarius and on January 19 th Sun also enters Aquarius, balancing the elemental energy in the sky. If the first two weeks of January have been infused with Cardinal and Earth energy, the 2 nd half of January will be much more balanced, especially thanks to Venus and the Sun who move into Aquarius. Aquarius brings Air and Fixed energy, helping us get the clarity we need to focus on what is really important. On January 26 th Mars enters Sagittarius. Mars feels good in the fiery sign of Sagittarius — he is still as assertive and bold as in Aries and Leo, but in Sagittarius, Mars acts with the bigger picture in mind, and wants to align his personal will with the divine will. This is a good time to expand your horizons, to do strategy work, to mingle with people with a different outlook on life than yours, to travel to a far away destination. Having two Full Moons in opposition to the planet of love is very interesting, especially given that both the Moon and Venus are the two celestial bodies symbolizing the two facets of the feminine principle. Moon and Venus describe the two feminine archetypes: On the other side, together with the Sun, we have Venus, the planet of relating, of giving and receiving, of what we like and dislike. In a nuthshell, the Moon describes the relationship we have with ourselves, so we can get our primal needs met, whereas Venus describes our relationship with the outside world, so we can get our social needs met. The two feminine principles are now in opposition. While the Moon is very close to the Earth and therefore has an even stronger influence on us, Venus is at the farthest away point from the Earth right now, and is willing to sacrifice her needs in order to please the Sun. Have a look at which houses in your natal chart you have Leo and Aquarius to get more clues about which area of your life represented by the Leo-Aquarius axis needs reconciliation. Enter your email address to subscribe to this blog and receive notifications of new posts by email. The truth of your understanding of this orchestra in the sky is immediately felt. For more information about what Solar and Lunar eclipses mean, see Lunations. All New and Full Moons in on the Astrology of page. A partial Solar Eclipse occurs on January 5, , at 15 degrees and 25 minutes of Capricorn , affecting people born with personal planets and points at approximately 10 to 20 degrees of the Cardinal signs Aries, Cancer, Libra, and Capricorn most significantly. A Lunar Eclipse occurs on January 21, , at 0 degrees and 52 minutes of Leo , opposing the Sun at 0 degrees and 52 minutes of Aquarius, and affecting people born with personal planets and points at approximately 26 to 30 degrees of the Cardinal signs Aries, Cancer, Libra, and Capricorn and 0 to 6 degrees of the Fixed signs Taurus, Leo, Scorpio, and Aquarius most significantly. 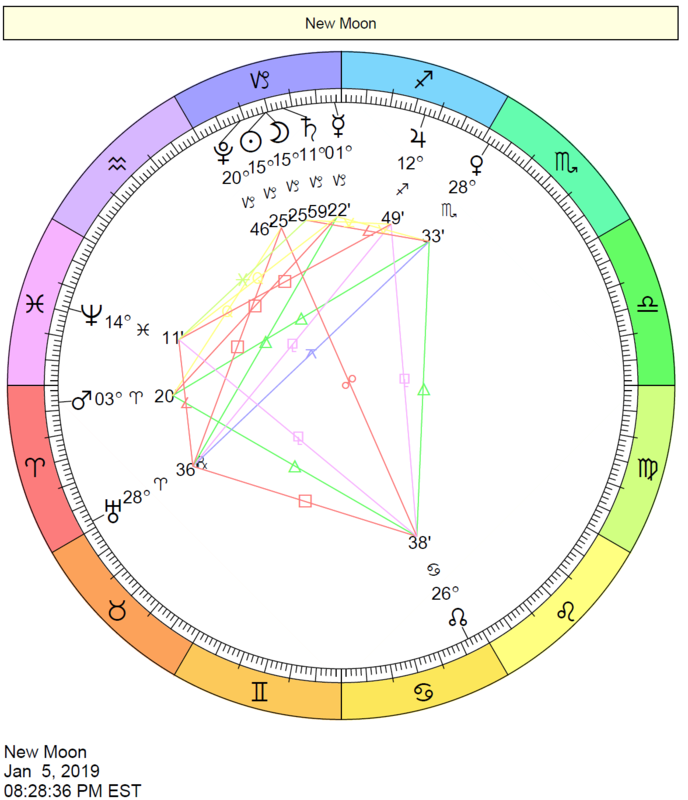 A Solar Eclipse occurs on July 2, , at 10 degrees and 38 minutes of Cancer , affecting people born with personal planets and points at approximately 6 to 16 degrees of the Cardinal signs Aries, Cancer, Libra, and Capricorn most significantly. A Solar Eclipse occurs on December 26, , at 4 degrees and 7 minutes of Capricorn , affecting people born with personal planets and points at approximately 0 to 8 degrees of the Cardinal signs Aries, Cancer, Libra, and Capricorn most significantly. The Astrology of — Overview. Jupiter in Sagittarius Faith, optimism, and a yearning to explore all kinds of new horizons: Travel, education, and other ways to stretch your horizons open new doors of opportunity. Religious, philosophical, and cultural matters are likely to have special appeal for you now; transmitting ideas on a broader scale brings gain. Creating a structure to empower and maintain your ideals and principles becomes a high priority, an article of faith. By taking on greater responsibilities of this kind, you become an inspiration to others.